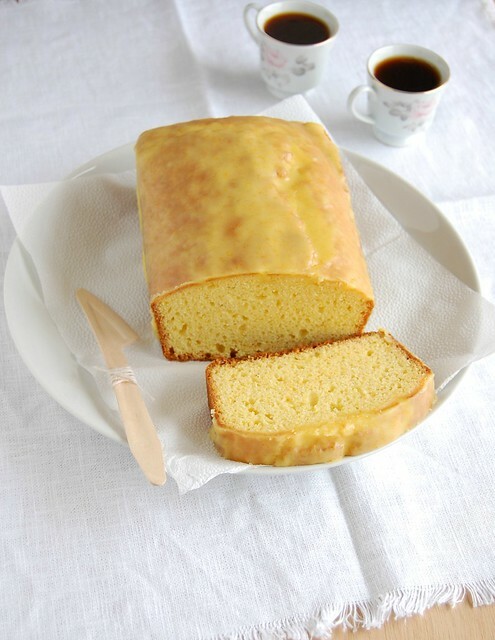 Looking for a simple cake recipe, I found this golden and delicious cake - it is the perfect companion for a cup of tea; it was a great way to use up the sweetened condensed milk left from the cheesecake making, as well a a wonderful way to put to good use some tangerines I'd had in the fridge for more than one week. Preheat the oven to 180°C/350°C. Lightly butter a 22x12cm (9x5in) loaf pan , line it with baking paper and butter the paper as well. Using an electric mixer, beat the egg whites and salt until frothy. Gradually add 2 tablespoons of the sugar then beat until a soft meringue forms. Set aside. In a large bowl, whisk together the melted butter, condensed milk, the remaining sugar, egg yolks, tangerine zest and juice and vanilla until smooth. Sift together the flour and baking powder over the batter and beat until smooth. Fold through the meringue quickly and evenly. Transfer the batter to the prepared pan and smooth the top. Bake for 40-45 minutes or until golden and risen and a skewer inserted in the center of the cake comes out clean. Cool in the pan over a wire rack for 10 minutes, then carefully unmold. Remove the paper and cool completely on the rack. Icing: sift the sugar into a small bowl and stir in the zest. Gradually add the juice, stirring until a pourable consistency (add more juice or water if necessary). Pour over the cake and set aside for 30 minutes to set. Beautiful cake! I love the tangerine glaze. I just bought a carton of tangerines so this cake will be perfect. It looks delicious! Omg, this cake looks fantastic. I can totally understand why it will be gone in one sitting. Great combination of tangerine and butter. Yum! I adore this cake. Who could resist tangerines and sweetened condensed milk together? I've been making it every year since you posted it when my favorite tangerines, Page mandarins, show up at the farmers' market. This year my oven stopped working just when Page mandarin season started. It took the gas company three weeks to come and repair it. Being a bakeaholic, I was impossible to live with. I finally got to bake it yesterday. It is tender and delicious, bursting with tangerine flavor. Thank you so much for sharing this and so many other delicious recipes. Your generosity is much appreciated.